This has gotta be one of the most ridiculous desserts I have ever laid eyes on! a few dollops of dulce de leche (caramel) and rich ultra fudgey brownie on top! I came across this crazy creation on Pinterest and quickly added it to my board of things I should make! The dangerous thing here is that these are quick and easy to put together if you have a brownie mix kicking around, which I did. Shared some of these bad boys around today and will wrap up the rest and share them around tomorrow so they’re outta my house for good and I will never make them ever again (okay, well maybe the next time I need dessert for a potluck/BBQ or somewhere there’s a lot of people to share them with) These are serious business. Cream the butter and both sugars (brown and granulated) until light and fluffy. Add eggs followed by vanilla and mix well. Add the flour, baking soda and salt and continue to beat until well combined. Fold in the chocolate chips. Now place the oreos on top of the cookie dough. Surprisingly enough, there are just enough oreos to top the whole thing! Dollop the dulce du leche on top of the oreos. Pour brownie batter on top and smooth it around with a spatula. My daughter and I made these the other day but your addition of caramel, oh my! Wow. These look amazing! Can you tell me did you make the Dulce de Leche or just used purchased? If so, what brand? Was it just caramel topping? thanks! Are these on weight watchers? How many points do you think they have? I think they should be included inthe next weight watchers magazine. LOL I think we could safely say about 10,000! I’ve only made them once. These look INCREDIBLE! I’ve seen them floating around pinterest and am scared to make them. Next potluck, good idea, that’s what I’ll make them for. I found your site perusing for yumminess and WOW!!! I will be blogging some decadent recipes in the next few days or so and will be including a link to your site! Thanks! So exctied to make this today……my daughter and I both pinned it and then it was pinned again to our “thanksgiving food” board. Thanksgiving us next weekend for us…..so these babies will be shared with a crowd. My bum rejoices! Going to try these out soon, they look so yummy. Do you know if they freeze well? Can you make these with store bought cookie dough? They should work just fine with store bought cookie dough! Hope you enjoy! do we know how these freeze? I would assume that they’d freeze okay but I don’t ever freeze cookies (they never last long enough ) so I can’t give you a good answer….sorry! Thanks so much! Typically they would not last here too!! I am wanting to bake ahead for an open house for 100 people and am looking for freezable appetizers and desserts. Have a Merry Christmas! UMMMMMMMMMMMM YUM! Just pinned this on pinterest! I recently made these, and they were amazing! I forgot to add the water in my brownie mix, but most of them still turned out ok…it was early in the morning before my big cup of coffee. I’m posting on my blog tomorrow with a shout out back to you. Thanks for the recipe! Love your blog. I tried to make these but at 50 mins, the brownies were still gooey. Trying ten more mins and hoping for the best! I had to bake an extra 17 mins for it to be done. @ 350 deg , gas stove. Wow, yours look great! Love the photo. I made these last night and they turned out pretty amazing. The cookie part seemed a bit underdone but not so bad that I wasn’t happy with them. I followed the exact recipe, except maybe my cookie recipe varied but that shouldn’t make a difference. They are definitely rich but if I’m never rich with money at least I’ll be rich with sweets! are you kidding me right now?!?!?! thank GOODNESS we’re going to a super bowl party this weekend and I have an excuse to make these…and promptly take them out of my house!!!!!!!!!!!!!!!!!!!!! Oh my god!! I think this is the best tasting dessert I’ve ever had!! I used truffle chocolate chip brownies, so delicious!! Mine are in the oven… and I am using peanut butter oreos instead because I lovvvvee peanut butter! can’t wait to try 🙂 thanks for the recipe!!!!!! Peanut Butter Oreos?????? I probably can’t get those in Canada 😦 They sound amazing!!! I just made these this morning & the chocolate chip cookies are really undercooked. Any suggestions on how to know if they are done–since you can’t see them (because of the parchment paper) and I can’t even use a tooth pick (because there are 2 other layers of stuff that I would have to go through)?? The brownies were perfect so I am worried about cooking them much longer. I wonder if I could just line the pan with chocolate chip cookie dough and cook it for several minutes before adding the oreos & brownie mix?? Partially prebaking the cookies is a good idea! You could also try baking on the lowest rack in the oven….but that still won’t solve the problem of knowing if they’re done or not. My cookies were a little over baked for my liking. I made these in my muffin pan from “Demarle at Home”. they were perfect! I baked them for 31 minutes! Baking them for 40-50 minutes is way too long. I baked 2 pans this weekend @ 2 different length of times and both were overcooked. I think 30 minutes would be plenty. thanks for the input, I’ve added a note to the baking instructions to start checking up on them at about 30 minutes! These look divine!!! This will be a great recipe for all of the summer parties! I made these tonight using refrigerated cookie dough … YUM YUM! They are so good that I am not sure I want to take them to the Bake Sale tomorrow! Thanks for sharing this! Re-pinned! They look & sound amazing! These are so fun and I bet incredible! 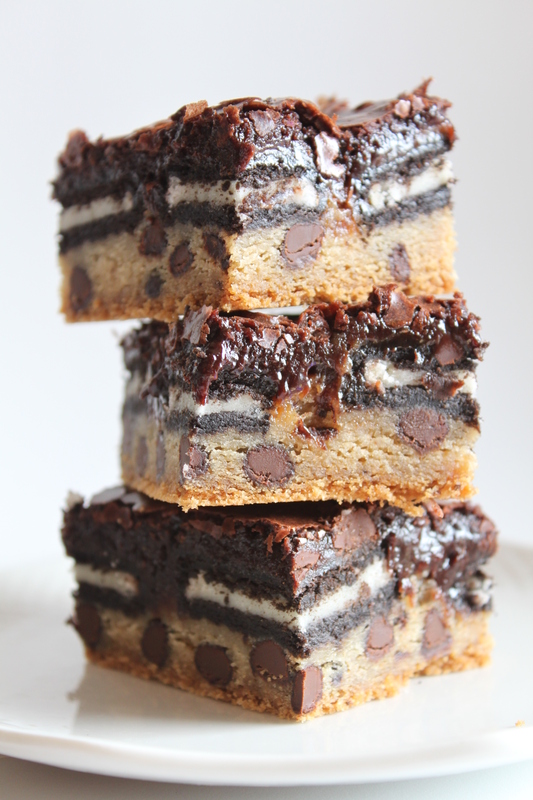 I can not wait to make these bars this weekend! I came across this on Tumblr and they look amazing! My friend just shared this fantastic looking recipe on Facebook! My daughter’s wedding is Sept. 22nd – 5 short weeks away and I am now in the midst of baking. Do you think these cookies would freeze well? Thanks for all input – Excited Mother of the Bride! Sorry to bother you again but can you tell me where I can purchase Dulce de Leche? Do I have to go to a gourmet shoppe? My local grocery store – a large chain – did not have it. I see you can make it from sweetened condensed milk but am trying to save time since I have so many batches to make. Thanks! In Canada, superstore (loblaws) carries a president’s choice brand that’s fairly inexpensive and very yummy! But if you can’t find it you can leave it out or use caramel sundae topping. I just made a huge sheet pan of these for a bbq yesterday and used a drizzle of sundae topping over the oreos but honestly, they’re so sweet that it really doesn’t need the extra hit of sugar! I was able to find dulce de leche at a specialty grocer near my home! I baked from 1 in the afternoon and finished cutting and packing cookies at 1 a.m with a short break for pizza! I made 20 dozen – cut bars small since they are deliciously rich. Did overbake a pan probably because I used different pans. Definitely check on cookies 30 min. and remove before they look “done”. Now on to baking Oreo truffles!! Glad Oreos were on sale this week for 100th anniversary! O.M.G. I made these last night. They are freakin’ awesome. I can’t stop nibbling on them. I don’t think I will weighing in with good numbers with ;;Jenny” this week. I was just curious: if I used store bought cookie dough, how much of it goes into one pan? I bought a tub of cookie dough so I’m not sure. I would do cookie dough 1/2-3/4 inch deep in the pan, so I can’t say exactly how much you’d use that way, at least 2 cups. They were the ghiradelli brownie mixes that came 4 or 6 in a box from costco so I’m going to assume they were “regular” size. I baked these for almost an hour. They seemed done. Turned them over and removed parchment. The cookie was not done. It was almost raw. Cook time on these relly seems to vary. Just made these in a 350 degree Gas Range. After 50 minutes, they appeared cooked, but once poked, the Brownie was still raw and liquid-gooey. Back in the oven for another 15 minutes. I used the Ghuradelli brownie mix. ( Costco) Next time I’ll try a Betty Crocker or such. Thanks for this. I saw it on Pinterest and repinned it to my “Recipe Likes, Must Try”. Note: Cool completely before cutting – the brownie mix still gooey with the melted chocolate bits. OMG! when I saw the picture I fell in lust which means I had to make them for Christmas. I followed the “diet” recipe version and without the dulce de leche (I didn’t have any on hand). They are WONDERFUL. Now due to the amount of the cookie dough I cooked it on a large cookie sheet with parchment paper and used 2 boxes of brownie mix to cover the top completely which made plenty to share with friends as take a home treat and I did adjust my oven heat to 300 and time 45. Thank you so much for sharing. Brought them to Christmas and everyone loved them! Warning: cut small pieces! These are filling and rich! I don’t have any parchment paper, would heavy duty FOIL work? It really would’ve been helpful to know what size package of Oreos. I bought what I would consider “normal” size (300 g) and only had 21 double stuffed Oreos – only enough to cover 2/3 of the 9 x 13 pan 😦 They’re in the oven now, so fingers crossed they’ll still turn out ok! I would expect them to turn out just fine, just a little less oreo in each bite! Thanks for sharing!! Yum!! Sharing with my friend on your blog 🙂 she loves recipes like this. how many bars did it make? making these for a bake sale at work on saturday! thanks! baking them as i type. the brownie part shouldn’t be gooey should it? Better to under bake a brownie than to over bake it! It will probably be still be a bit gooey, you don’t want the cookie to over bake! Just took mine out of the oven. Cooked for 40min @ 350 & the brownie part was still liquid! Kept adding 15mins- did this about 3 times. They are still a little ‘soggy’?? But remembered I put the Dolce de Leche and I think that is what is contributing to the gooy-ness? I’m gonna let them cool all the way and pray they are still ahmazzing! 🙂 The little tastes I’ve snuck from the sides is Guuuud! They are going as after game snacks for my daughters soccer team tomorrow… I’ll let ya know! How many brownie e doesn’t he recipe maker? It really depends on what size you decide to cut them but a 9X13″ pan should yield about 24. Do I have to use a brownie mix? Can i make homemade brownie matter? any brownie will do! I just happened to have brownie mix the first time I made these, but I usually make brownies from scratch! do you think I could used crushed oreos for this recipe? I think that crushed up oreos would be just fine (not to be confused with oreo crumbs) they just won’t have that defined oreo layer when cut. How many bars does one pan make? Delicious! Couldn’t take off my eyes from the pic 🙂 Gonna try it soon and will let you know how it goes. Is it necessary to use parchment paper? I wouldn’t say it is necessary, but I find it convenient. I bake kind of on Auto pilot, and forget that not everybody does the same so I realize my recipes could be more detailed lol Thanks for the feedback! Amazing! My husband and I followed your recipe to a T, just left out the Dulce de leche. Took them out at 35 minutes, and they were perfect. HE WON this contest at his work, for best dessert and got a free IPAD! thank you!! So AWESOME! You can mail the IPAD to….. haha just kidding 🙂 So glad they turned out great, thanks for the comment! These are thebomb.com! I had random people hugging me at a party for making these sinful delights! Serve with some vanilla blue bell ice cream and enjoy the sugar coma!!! Hooray! I made these in muffin tins recently…they weren’t as big of a hit as when they’re made into bars and you can see the layers!!! I attempted these last night and after 50 minutes my brownies were still too gooey. I ended up throwing it out with frustration. Attempt #2 tonight, hope it works! I’m going to try baking it in two smaller pans to see if there is a difference. Can you use cookie dough that is already prepackaged? Sure can! Go ahead and use your favorite cookie dough of choice! Be sure to start checking these part way through baking! The could take longer or shorter than the recipe specifies especially if using a different cookie dough! did you use a metal pan or glass pan flat or with edges?? I use metal baking pans all the time. 9X13″ cake pan with sides. I plan to make this for an after-swim-meet treat. These boys burn so many calories, this will be good for them! I tried these on my bday. They are soooo sweet my family called them suicide bars! Is the parchment paper a must? Parchment paper is never a must, however, it does it make it much easier to remove the bars from the pan so they can be sliced. I just made these. WOW. They are delicious. My grandma is a known chocoholic. I saved her a huge slice. She is going to love them. I do have a couple of questions. They came out absolutely perfect, but, how long will they stay fresh in a covered “brownie” container. Do these have to be refrigerated? I have had success baking the brownies in two steps. I bake the chocolate chip cookie dough layer at 350 degrees for 25 minutes. Then I top with the Oreos, caramel and brownie batter. I then bake it for an additional 35 minutes. Give it a try! das kann ja heiter werden! · cookies gebacken!